The trial is expected to start in early 2019 and will likely revive tensions between Catalonia and Spain’s central government, which have eased since new socialist Prime Minister Pedro Sánchez came to power in June. The court said nine of the jailed former leaders including Catalonia’s ex-vice president Oriol Junqueras should be tried for rebellion, which carries a prison sentence of up to 25 years. But the region’s former president Carles Puigdemont – who is also accused of rebellion over his role in the separatist drive and is in self-imposed exile in Belgium – is not among the group because Spain does not allow trials in absentia. The Catalan parliament declared independence on 27 October last year following a banned secession referendum that was marred by violence as Spanish National Police sent in from Madrid beat voters with batons and fired rubber bullets. The move triggered Spain’s worst political crisis since the return to democracy following the death of long-time dictator Francisco Franco in 1975. Apart from Junqueras, the court ordered five other members of the Catalan government to stand trial for rebellion, along with the ex-president of the Catalan parliament, Carme Forcadell. The leaders of two powerful grassroots separatist groups, Jordi Sanchez of the Catalan National Assembly (ANC), and Jordi Cuixart of Omnium Cultural, were also ordered to stand trial for rebellion. Amnesty International earlier this month called for the release of the two men who have been in jail since October 2017, saying their continued detention was ‘excessive and disproportionate’. Some of the 18 accused also face charges of embezzlement or disobedience. Puigdemont and fellow separatists have all denied any wrongdoing, saying the 1 October 2017 plebiscite gave them the authority to break away from Spain. 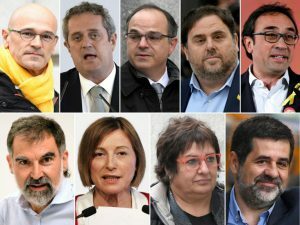 Junqueras and the other former Catalan cabinet members were detained in November 2017 pending trial after organising the illegal referendum and declaring independence. The central government responded to the unilateral declaration by sacking the Catalan government, taking control of the wealthy northeastern region by applying ‘Article 155‘, and calling a snap regional election. Catalan separatist parties once again won a slim majority in the regional parliament in the December 2017 polls but they have divided over what strategy to pursue to achieve independence. The separatists have demanded that Sánchez’s government free the jailed leaders – who they call ‘political prisoners’ – or drop some of the charges against them. Sanchez’s minority PSOE socialist government, which needs the support of Catalan separatist parties to pass its draft budget for 2019, has taken a more conciliatory approach than the conservative People’s Party (PP) government it replaced earlier this year. Several ministers have said they would prefer if the former Catalan leaders were not in pre-trial detention even as they stress only the courts can free them. Sanchez’s cabinet has offered a vote on increased self-government for Catalonia but categorically ruled out a referendum on self-determination or independence. ‘Nothing has changed. The words yes, but not the facts,’ said Sergi Sabria, spokesman for Junqueras’ leftist Esquerra Republicana de Catalunya (ERC) party. PP leader Pablo Casado accused Sánchez on Wednesday in parliament of being a ‘participant and accomplice to a coup d’etat’, in a reference to Catalonia’s failed separatist bid.